Solar photovoltaics, commonly known as Solar PV, is the technology that generates electricity from daylight. Solar PV should not be confused with solar thermal, which generates hot water only (Please see below), as these are two different technologies. PV will work in low light conditions, even in UK wintertime, but the amount of power produced will vary with the amount of daylight. 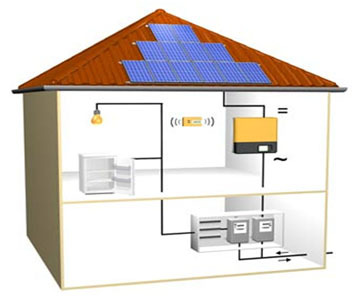 A solar PV module is a device which produces electricity when exposed to light. During daylight hours this PV array will produce energy, which is then fed to the lights and sockets etc where it is used in the usual way. A unit of electricity generated by your PV system will always first be used within the house when there is demand for it. If you don’t use all the electricity you produce, for instance when you are away on holiday and there are not many appliances on in the house, the surplus can be fed back into the national grid for a cash return. From 1st April 2010 the UK government has offered a ‘Feed-In Tariff’ (‘FIT’). This is a scheme designed to increase the uptake of renewable energy technologies by guaranteeing the returns from installations such as Solar PV systems for 25 years. The generation part of the tariff is a payment for every unit (or kWh) generated by the PV system regardless of whether it is used in the home or exported to the grid. The export element of the tariff is an additional 3p for every surplus unit that is exported to the National Grid. We are here to help you decide on the best natural heating solutions for your situation. If you are unsure of what you need, or have any questions about our products, please do not hesitate to contact us. Our sales/technical team will be happy to talk you through it. Solar thermal systems take energy from the sun and convert it into useful heat to provide hot water. Solar Collector Modules evacuated tubes collect heat through infra red radiation and transfer it to the fluid in the solar circuit pipes that flow through them. Unvented cylinder a twin coil cylinder is generally required. 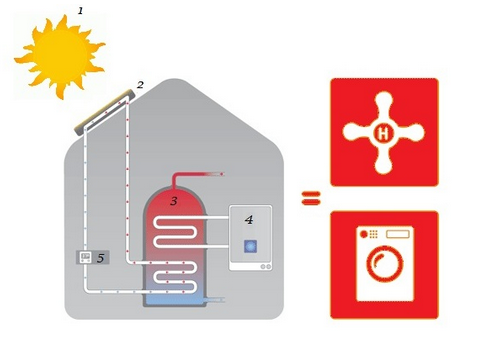 The hot fluid from the solar circuit enters the hot water cylinder through a heat exchange coil just as any domestic system. Where necessary the second coil , that of gas, oil or heat pump will top up the hot water requirements. The solar circuit is operated by a controller which drives a pump, the solar circuit transports the hot fluid from the collectors to the hot water cylinder.